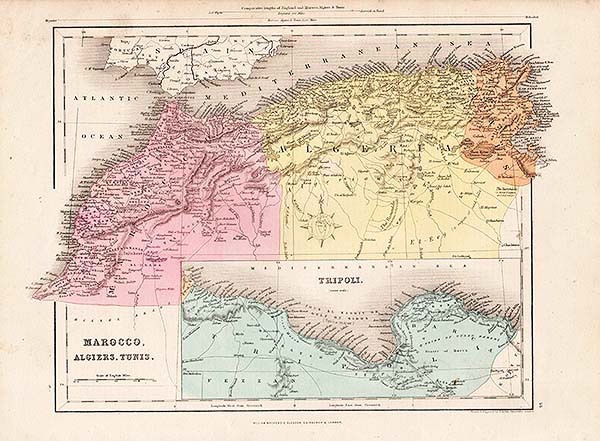 North Africa or Barbary I Marocco. S.D.U.K. More Info by Jackson, Washington, Graberg, Arlett; Engraved by J & C Walker. Published under the superintendance of the Society for the Diffusion of Useful Knowledge by Baldwin & Cradock, 47, Paternoster Row, London. 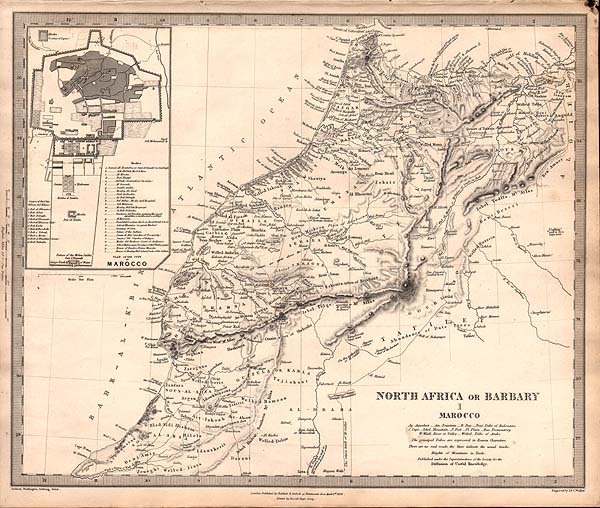 The map shows Morocco from Cape Noun, on Atlantic Coast, to the Gibraltar Strait to the Gulf of Melillah and border of Algiers. Inset Plan of the City of Marocco (Marrakesh). Also has a key to Mosques and Gates of the City. by Jackson, Washington, Graberg, Arlett; Engraved by J & C Walker. Published under the superintendance of the Society for the Diffusion of Useful Knowledge by Baldwin & Cradock, 47, Paternoster Row, London. The map shows Morocco from Cape Noun, on Atlantic Coast, to the Gibraltar Strait to the Gulf of Melillah and border of Algiers. Inset Plan of the City of Marocco (Marrakesh). Also has a key to Mosques and Gates of the City. Tanger and Bay of Tanger. More Info This sea chart shows the coast around the port of Tanger and Bay of Tanger. The chart shows depth soundings and anchorage points. Published in "Recueil de 163 des principaux Plans des Ports et Rades de la Mediterranée, dont 40 ont été derniérement publiés par Jean Joseph Allezard ancien Capitaine de Marine. Gènes: Yves Gravier, 1804. " Later coloured by hand. Fine condition. 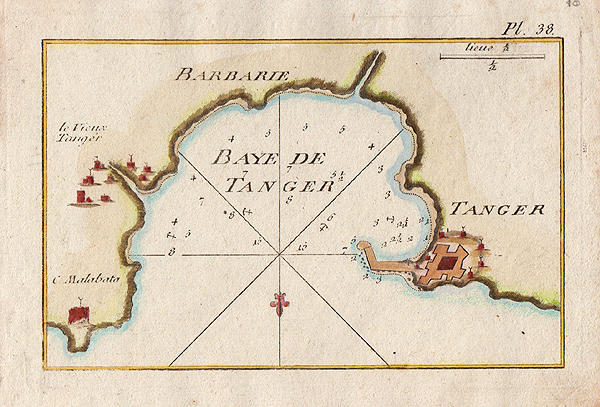 This sea chart shows the coast around the port of Tanger and Bay of Tanger. The chart shows depth soundings and anchorage points. Published in "Recueil de 163 des principaux Plans des Ports et Rades de la Mediterranée, dont 40 ont été derniérement publiés par Jean Joseph Allezard ancien Capitaine de Marine. Gènes: Yves Gravier, 1804. " Later coloured by hand. Fine condition. More Info This sea chart shows the coast of Tanger and Bay of Tanger. The chart shows depth soundings and anchorage points. Published in "Recueil des principaux plans des ports et rades de la Mer Méditerranée estraits de ma carte en douze feuilles, dédiée à Mons.gr le duc de Choiseul, ministre de la guerre et de la Marine, gravée avec privilège du Roy, par son très humbre serviteur Joseph Roux Hidrographe du Roy à Marseille, 1764" - an atlas which contains strongly engraved copper plate plans of ports and harbors around the Mediterranean. 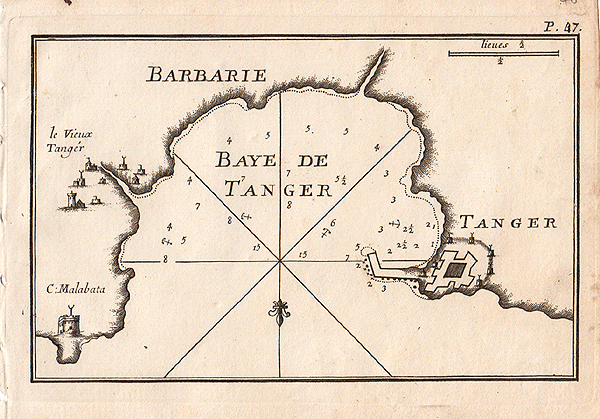 This sea chart shows the coast of Tanger and Bay of Tanger. The chart shows depth soundings and anchorage points. Published in "Recueil des principaux plans des ports et rades de la Mer Méditerranée estraits de ma carte en douze feuilles, dédiée à Mons.gr le duc de Choiseul, ministre de la guerre et de la Marine, gravée avec privilège du Roy, par son très humbre serviteur Joseph Roux Hidrographe du Roy à Marseille, 1764" - an atlas which contains strongly engraved copper plate plans of ports and harbors around the Mediterranean.